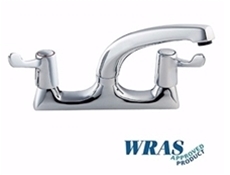 Die-Pat chrome plated sink mixer taps with 7" bi-flow swivel spout. Levers available in 3" and 6". WRAS Approved. 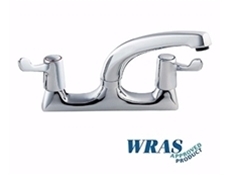 Deck Mounted Sink Mixer Tap with 3" Levers - 7" bi-flow Swivel Spout - 1/2"
Sink Mixer Tap with 6" Levers - 7" bi-flow swivel spout - 1/2"